Keep your travel essentials stylishly stowed and neatly organized in the American Flyer Animal Print 5-Piece Luggage Set. This compact, lightweight and durable polyester set includes a 28″ wheeled upright suitcase, a 24″ upright, a 20″ upright, a wheeled duffel bag ideal for use as a carry-on case, and a personal tote bag, and it features a distinctive animal print pattern for locating it easily at the carousel. 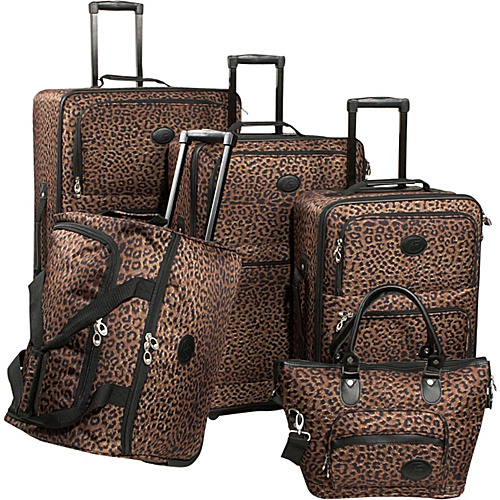 Each case boasts a spacious, lined interior with zippered lid compartments, garment restraints, and plenty of room for your clothing, shoes, accessories, and toiletries; and the American Flyer Animal Print 5-Piece Luggage Set comes with in-line skate wheels and a telescoping handle system for smooth maneuvering.